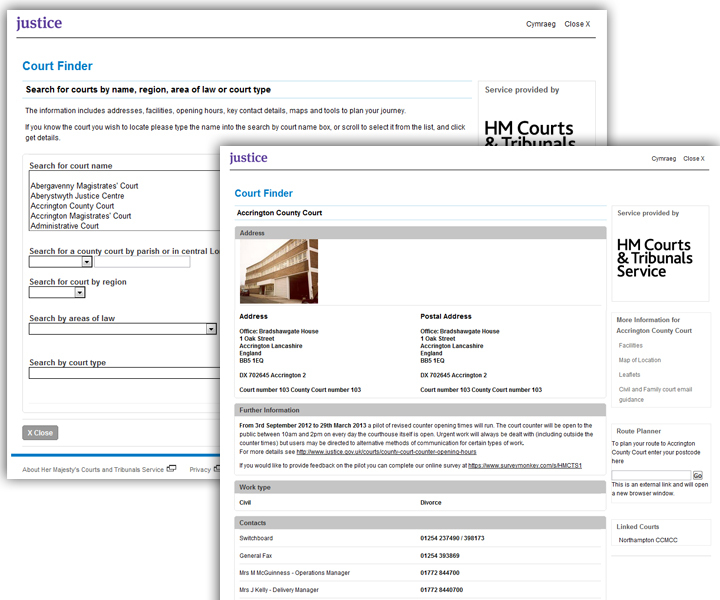 Court finder is a tool used by all sorts of people, including members of the public, lawyers and court staff. It can be used to find details of a court, for instance if you’re going to give evidence as a witness or need to know where to send a divorce form. It began as a simple court look-up tool but now includes other venues like tribunals. The tool is incredibly popular but desperately needs redesigning to make it easier to use. Being an old application that we’ve inherited, the court finder has no analytics, so gathering useful data about what works and what doesn’t is tricky. To make progress, we're recreating the tool on a new platform to provide a better user experience, enhanced functionality and crucially full analytics. We will launch this as public alpha and iterate wildly. We’re starting off by making some improvements based on GDS design principles. From customer comments, we know that users are overwhelmed with the long list of search options. Users can currently search by court name, parish,London streetname or postcode, region, court type or 89 areas of law. We know that many users search by court name, so are including this as an auto-complete field. Instead of having multiple options for searching by location, we’re having one simple postcode field. Postcode currently doesn’t work outside of London, so we’re seeing if we can use Royal Mail’s Postcode Address File (PAF®) data to improve results. We’re refining the list of areas of law to provide a short list of simple, intuitive categories (eg adoption, crime, divorce), drawing on data on popular search terms. More specialised users will still be able to make more complex queries using an advanced search page. We’ve also streamlined the information listed about the courts on the results pages. Our overall approach is phased, but by providing a functional equivalent, a simple interface and analytics we can start to see who our users are, what they want and fine-tune the application by removing or reprioritising what we present. The public alpha for the new court finder will go live in April. We’d love to know what you think, especially if you’ve had to use the tool in the past to find details of a court. Hi, what about the idea of proximity information? This is an increasing trend in retail and the idea is: you can use court finder on web and that is fine but I m sure that quite a lot of people need that reminder once they exit the bus or train and try to remember where to go. This can be resolved by having an app that uses gps location and combines data with court loxations- eg courts near me. Thanks for your comment, we will definitely be exploring options like this when we build and test the tool, but this is the type of thing that people will find really useful. Just a point, if a user is trying to find a court but doesn't know a postcode of the target area for any reason, they'll be stuck. Perhaps you could check whether the entered criteria matches a valid postcode pattern first, otherwise use a different location service. Don't forget Fines Enforcement information - including regional confiscation units. We in the Wales Confiscation Unit receive several calls a week from people looking to pay a court fine, and customers tell us our "incorrect" number was first result on google. Thanks Lee - we're aware of this issue, and are in discussions with colleagues about fixing issues with the enforcement information. Our team is leading on work to introduce the Single County and Family Court by April 2014. This will mean changes to Courtfinder, how do we ensure the requirements are included as part of this work? Thanks - we did know about this, and will factor it in when we develop a later version of the tool. Obviously for the time-being we'll have to reflect the current state of play, but we'll be in touch about the changes and refinements. I agree, this is an ideal candidate to be done digitally (properly). You mention that this tool is incredibly popular. Do you have any data on use that you can share e.g. number of unique hits? You also mention getting to grips with the raw PAF data. I, for one, would welcome a blog post on that topic. Although long overdue, I've just published a new post on the PAF http://blogs.justice.gov.uk/digital/2013/06/royal-mails-postcode-address-file-taming-the-beast/. Including the Post Code data to search by from the PAF would be fantastic. I currently work in enforcing unpaid debt through the county court system and the ability to search in bulk (through an api or similar) would be ideal. My office is on target to issue over 4000 claims per year and finding the home court is currently a vast drain on resources. To amend information on your court, you'll need to get in touch with your contact at the regional support unit for your area, who will have access to the tool to do the updates.